It’s going to rain Sunday – which is a good thing, we need rain and I think I’ll use some of the day to make up soil blocks and get seedlings started in the greenhouse. I wrote two successful grants a few years back – one through SARE (Sustainable Agriculture Research & Education) and one through RAFI (Rural Advancement Foundation International) for a project I was working on – utilizing rabbits in a market vegetable program. At that time I was keeping my rabbits in open bottom tractors that I moved around on the grass. That didn’t work out too well – the rabbits both escaped and they died from coccidia which they contracted from eating grass on the ground. I stopped “tractoring” them and put them back in cages until I came up with the idea of putting the tractors on top of 4×8 raised beds. There’s wire on the ground to keep them from digging out and I deep-bed the pen with straw. I do lose some to coccidia – it can be a problem in rabbits, even rabbits in wire cages, but I’ve pretty much bred it out of my lines. As soon as rabbit babies are six weeks old or so, I put them out with their mothers until they are maybe three or four months old then I remove the mother and either re-breed her or let her rest for a few more months and the cycle starts over again. When I process a pen of rabbits (or they’re all sold as breeders) I clean out the tractor and put the bedding (with the fantastic rabbit manure) to compost in raised beds in the garden area. This results in amazingly fertile soil for growing vegetables. The grants were demonstrating that people who raise market vegetables could very easily add rabbits to their farm and utilize them for their meat, their manure and their ability to convert weeds and vegetables that can’t be sold into meat and more manure. It’s a way that farmers can have a ready supply of very healthy, easy to raise and process meat, fertilizer and a way to dispose of extra vegetables and weeds. It’s really a perfect way to become more sustainable. Now the garden, it’s been problematic here. At one time we had a flat area that Wally and I toiled over making beds to plant it. 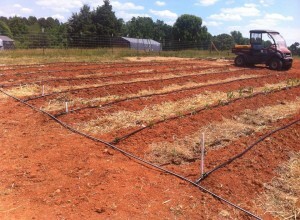 We installed drip irrigation. We suffered a bad drought three years ago and didn’t want to risk running out our well so we stopped watering it. Of course the vegetables died. We tried it again the next year but had another drought. Above is a picture of the irrigated beds that Wally and I made. The goat barn is here now. We’ve since gone back to raised beds (there’s a goat barn and milking room where the garden once was). Irrigation of the raised beds was problematic last year but I think I’ve figured out how to fix it – we’ll see this year. 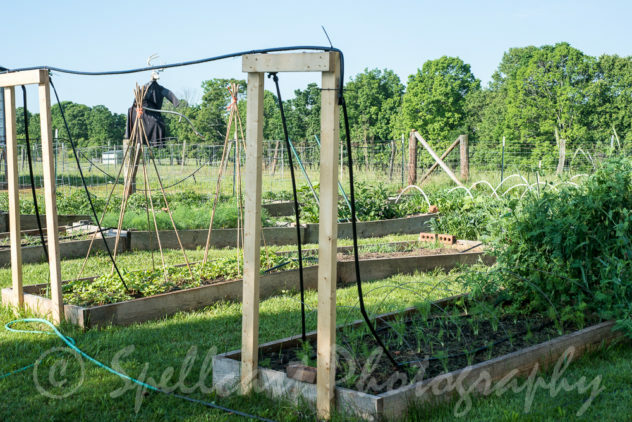 Above is the raised beds from last year – the header rows for the drip irrigation are raised up like this so that Wally could mow between the beds – it didn’t work properly. For this year, I purchased additional connectors so I can connect the water supply to each individual row – they won’t all be connected. This means I’ll have to water a row at a time but that’ll go into my scheduling I mention in the next paragraph. I’ve got a line of raised beds that have composted down enough to plant seedlings in. I start them in soil blocks which I really love. Making soil blocks is fun and meditative. Note to self – must stop and get some heavy rubber gloves to wear while making them – it’s like playing in the mud. The goal this year is to set apart a portion of every day of the week to work on one row of raised beds (that’s four, 4×8 beds) and either planting or weeding so I can keep up with it. Farm work is an incredibly healthy and meditative activity – I need to keep telling myself this. The good thing about weeds is that they not only feed the rabbits but the ducks as well.